Summer goes quick! So before it is gone in 2018, go outside and get a work break in! 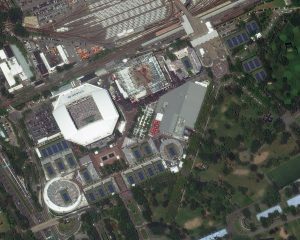 But before you head out, be sure to gander this about 44-centimeter WorldView-3 collected at a high tilt angle over the 2017 US Open tennis Grand Slam held in Queens, New York City at the USTA Billie Jean King National Tennis Center. The US Open is played on hard courts and is the final Grand Slam of the season. This image was collected on September 4, 2017, a day that was full of both Men’s and Women’s singles Fourth Round match ups. This entry was posted in The Geospatial Times and tagged featured products, The Geospatial Times, us open, Your Imagery Work Break by Apollo Mapping. Bookmark the permalink.